Newgrange (Irish: Sí an Bhrú) is a passage tomb of the Brú na Bóinne complex in County Meath. It is one of the most famous prehistoric sites in the world, and indeed the most famous of all Irish prehistoric sites. Newgrange was built in such a way that at dawn on the shortest day of the year, the winter solstice, a narrow beam of sunlight for a very short time illuminates the floor of the chamber at the end of the long passageway. Newgrange was originally built between c. 3300 and 2900 BC, which means that it is over 5,000 years old. According to Carbon-14 dates, it is more than 500 years older than the Great Pyramid of Giza in Egypt, and predates Stonehenge by about 1,000 years. 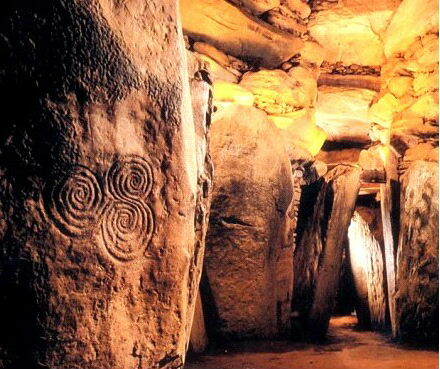 In the Neolithic period, Newgrange continued as a focus of some ceremonial activity. New monuments added to the site included a timber circle to the south-east of the main mound and a smaller timber circle to the west. The eastern timber circle consisted of five concentric rows of pits. The outer row contained wooden posts. The next row of pits had clay linings and was used to burn animal remains. The three inner rows of pits were dug to accept the animal remains. Within the circle were post and stake holes associated with Beaker pottery and flint flakes. The western timber circle consisted of two concentric rows of parallel postholes and pits defining a circle 20 m in diameter. A concentric mound of clay was constructed around the southern and western sides of the mound and covered a structure consisting of two parallel lines of post and ditches that had been partly burnt. A free-standing circle of large stones was constructed encircling the mound. Near the entrance, 17 hearths were used to set fires. Yeah 'twas bad form on our part, not really giving enough of a sh*t to do anything about it.. I went to Newgrange once a long time ago and I thought it was fantabulous, but there were too many tourists around. Why can't I just have all our national monuments to myself? According to Carbon-14 dates, it is more than 500 years older than the Great Pyramid of Giza in Egypt, and predates Stonehenge by about 1,000 years. hm. thats a pretty fascinating fact. Sadly, haven't been to the newgrange but have been to the Pyramids (which aren't very interesting I thought). Looks like a lovely place that I'll pop onto my long life's to do list.